Café Grounded, Bedminster Parade, Bristol on Wednesday 11th April 2018, 2pm – 7pm. East Street Mews is a Bristol based initiative that will create 11 contemporary apartments to provide much-needed affordable housing for young homeless people in Bristol. With young people in the UK three times more likely to experience homelessness than the rest of the population, providing suitable accommodation is vital and forms a huge part in getting individuals back on their feet. “This project is enabling us to address the huge need for high quality and truly affordable homes for young people in Bristol. There is a great need for stepping stone or ‘move on’ accommodation for young people living in hostels or at risk of homelessness. This is an important project to prevent youth homelessness and help young people turn their lives around.” David Walton, housing director, Developing Health & Independence (DHI). 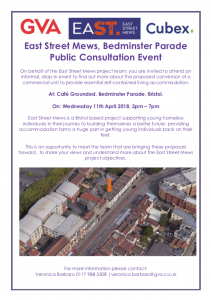 This is an opportunity to meet the wider team that are bringing these proposals forward, to share your views and understand more about the East Street Mews project objectives.